If you intend to copy my x-ray experiments, let’s be safe now, shall we? Nonionizing radiation, the stuff of microwave, infrared and visible light doesn’t have the energy needed to break chemical bonds, so we may sit out in the sun and get bombarded with a thousand watts and feel no ill effects. Once we reach ultraviolet though, this radiation now has enough energy to break those chemical bonds; including the ones in our bodies. This means this high energy radiation can damage DNA. In high enough doses, it may even cause radiation sickness. Acute radiation sickness occurs when your body has absorbed a large amount of ionizing radiation, usually on the order of several sieverts. What makes radiation lethal is the effect it has on DNA. When a high energy particle, be it a photon or some other particle collides with DNA it breaks bonds and rearranges the bases. Normally your cells can repair this damage, but if a cell fails at that task it often commits suicide before it divides. For long living cells such as muscle this isn’t too much of a problem, since the other cells have time to replace the dead ones. For short-lived cells though, this apoptosis becomes a major issue as cells are dying too fast to be replaced. Such short lived cells include the mucus-making cells that line the intestinal wall. When exposed to enough radiation, these mucus cells start to die off en masse, and so are not replaced. No mucus cells means there will be no mucus, and no mucus means there is no protection from stomach acid. The intestine stops absorbing food particles, acid burns the tissue, and eventually you die of sepsis. If somehow you survive this ordeal, you will now need a bone marrow transplant since the short-lived bone marrow cells have died off. Radiation sickness symptoms include nausea, stomach pain and a lack of energy, and a detailed chart of symptoms can be found here. That, among other reasons is why we shield ourselves from ionizing radiation! Keep in mind that it takes a very large amount of radiation to cause radiation sickness, not something a fiestaware plate or even a radium painted clock could ever produce. However, a Coolidge tube is certainly capable of generating very intense radiation. In order to reduce the amount of radiation you are exposed to, shielding is put in between you and the radiation source. This shielding reduces the amount of radiation to an acceptable level. What exactly is an acceptable level though? In the end, that’s up to you to decide, but generally the idea is to go as low as reasonably practicable. In order to help determine what is an acceptable level, I have here a chart of activities that expose a person to radiation. There are multiple different types of radiation and each type must be treated differently when it comes to radiological protection. Some types require more shielding than others and since this is a guide I will now do some explaining. First with particle radiation, then with electromagnetic radiation. But before we do that let’s discuss energy. Radiation can have different energy levels, energies which are measured in electron-volts (eV). One electron-volt is defined as the amount of energy gained by one electron as it moves through an electric field of one volt. For example, green light photons usually have an energy of about 2.3eV, while blue light has an energy of 3eV. More energetic radiation is able to cause more damage when it hits something, and this is why microwaves such as those emitted from cell phones (0.00001eV) cause no chemical damage while gamma rays which may have an energy of 5 million eV can cause major damage. Generally higher energy radiation is harder to shield than lower energy radiation, but when it comes to particle radiation the type tends to play more of a roll when determining penetration. Usually particle particle radiation tends to be the least penetrating. Alpha decay is the most common method of radioactive decay. What happens with alpha decay is the unstable element ejects a duly ionized helium nucleus known as an alpha particle. In fact, all the helium on earth comes from the decay of uranium and other elements underground. Although alpha particles are very high energy, often having energies in the MeV range, they are very large and stopped very easily. In fact an alpha particle cannot even make it past a piece of paper, or even skin for that matter. 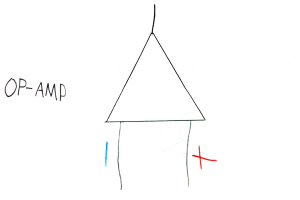 Alpha particles usually have a hard time making it through more than 3cm of air, so therefore no special shielding is necessary for alpha radiation. However, the real danger of alpha radiation comes from ingesting isotopes –where they can cause significant internal damage to your body. When working with alpha emitters, always, always wear gloves and take appropriate precautions to never ingest even microgram quantities! The next type of radioactive decay is beta decay, a process in which a neutron is converted into a proton and in exchange an electron and a neutrino is ejected. The neutrinos are of no concern since they are small, light and neutral, and thus pass through any matter they encounter and fly off into space like a ghost. The speedy electron known as a beta particle has a negative charge though, so it can interact with matter and thus pose a hazard. Fortunately beta particles are not very penetrative; more often than not, they are easily shielded by thin plates of metal. The last type of particle radiation is known as neutron radiation; something that is created when atoms are either fused together or fissioned apart. Unlike all other forms of radiation, neutrons can actually turn things radioactive! This is because when a neutron smacks an atom it may stick to it, turning that atom into another stable isotope or possibly a radionuclide. Unless you are either playing with Farnsworth Fusors or uranium reactors neutron radiation is not much of a concern, but nonetheless it is best shielded with light materials of all things, materials such as water and aluminum. Large amounts of water make an excellent neutron moderator, but because of this the human body does too. Therefore neutron radiation is especially dangerous to living things so do everything in your power to avoid it. Now that we have particle radiation out of the way it’s time for electromagnetic radiation: highly energetic photons. There are two types of electromagnetic radiation you should concern yourself about; gamma and x-rays. First let’s start with gamma rays. In certain radionuclides the atom’s nucleus is left in an excited state after beta or alpha decay. This energy is then released via a very high energy photon. By high energy I mean several MeV, and thus gamma rays are very penetrative. It takes quite a lot of material to stop them, so lead is often the material of choice for gamma shielding. If for some reason you have a very active gamma source use plenty of lead to shield it. Something like 5cm or more of that grey metal should be sufficient. The other type of electromagnetic radiation I have to discuss is x-rays. X-Rays are produced when electrons dump a large amount of energy into a single photon, thus creating a very high energy light particle. X-Rays are a lot like regular light: they travel in straight lines, can be reflected somewhat, and scatter in the air much like a green laser beam. When experimenting with x-rays, always make sure your lab is of light construction. While cinderblock walls are great for stopping x-rays from escaping your lab, they are also great for reflecting them back at you! It’s better to have them escape rather than to have them bounce around (that is of course, if you don’t have neighbors). When possible, be sure to either point your x-ray beams down to the earth or up in the air: anywhere where it is unlikely to be intercepted by an animal or human. NEVER power up an x-ray tube in a shared residence or an apartment without full knowledge that the radiation will be contained, and NEVER intentionally expose yourself to x-radiation. It is important to shield yourself from x-rays to prevent overexposure. The amount of shielding required is entirely dependent on the energy and quantity of x-rays being stopped. 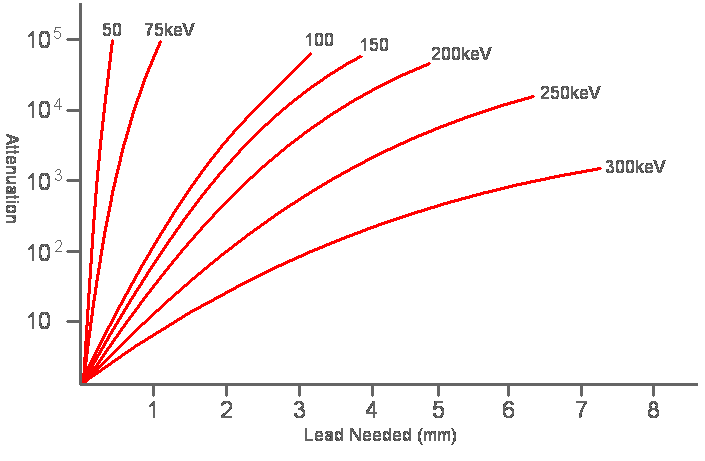 Lead is the ideal shield for x-rays because it is cheap, easily workable and has a high nuclear charge; something that lets it absorb electromagnetic radiation very well. For convenience I have prepared this chart of energy vs. attenuation vs. amount of lead needed using the standards set by the International Atomic Energy Agency. As you can see by that chart, attenuation is dependent on the x-rays’ energy, and since gamma rays are essentially higher energy x-rays stopping a 10MeV gamma ray would require lots and lots of lead. X-rays on the other hand are easier to shield, and 1mm of lead all but completely stops 50keV x-rays. Personally I recommend using at least 1mm of lead to shield 50keV x-rays and 2mm to shield 75keV ones, but the choice is entirely up to you after all. Considering the x-ray producing item being shielded is probably a Coolidge tube, much of the shielding should be done via the use of a tube jacket. It’s simply a lead jacket that is fitted around the tube with a hole is punched in the center to let the beam out. Using lead sheet and a soldering iron, a tube jacket can be made in about a half hour. Using one will certainly save you a lot of headache later on. Despite your best efforts at shielding the x-radiation, Compton scattering and a little bit of reflection will scatter some around and back to you. This is for the most part unavoidable, but always have some sort of radiation detecting device nearby so you know you are in a safe place to stand. An acceptable maximum level of scatter would be about 1000 counts / minute, or 10 times the natural background level. Where I live the natural background level is measured to be 100cpm, so by exposing myself to 1 second worth of scattered radiation I am absorbing the equivalent of 10 seconds of taking a nap, or perhaps the dose received by eating one eigth of a banana. As with any kind of radiation, be it light, radio, gamma or x-rays, distance is the most useful tool for protection; –the farther you stand from the source the less radiation you will receive. Inverse square law applies here, so by simply doubling your distance from the source the does rate will be 4 times less. Nothing beats getting the hell away from a source of radiation! That’s about all I have to say about radiation and radiation safety. 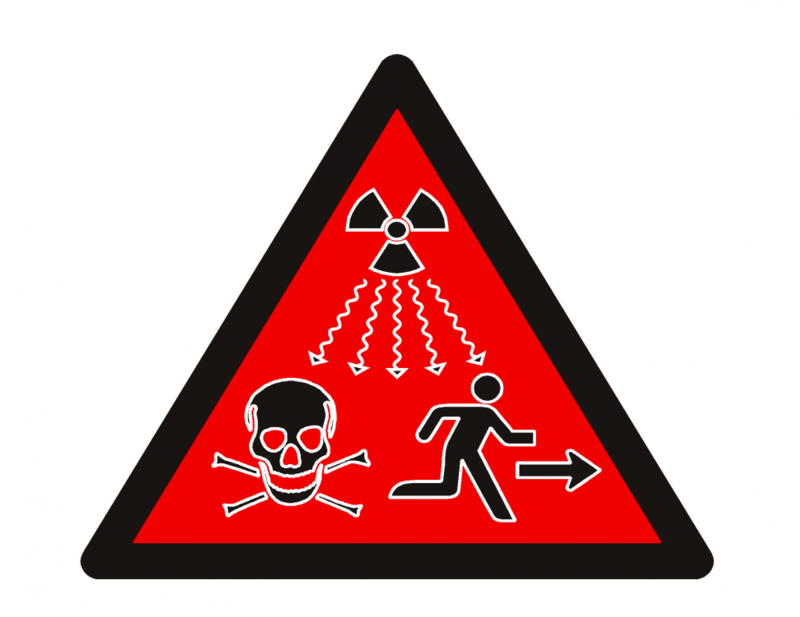 Be smart, and remember there is no cure for acute radiation sickness. can deplete calcium and other minerals.Can you help me? I don’t know where you got your information, but evidently it was from someone who has never read a text on physics. For reference, green light is ~ 1eV per photon. IMHO this example is a bit misleading, sun is also a source of ionizing particles, most of them can’t reach Earth’s surface, but ultraviolet in small amount can (and can lead to skin cancer, faster skin aging, or sunburn, all due to body cells damage). Long exposure on high amount of sunlight means exposure on unhealthy UV too. I like your article, it’s very good written.